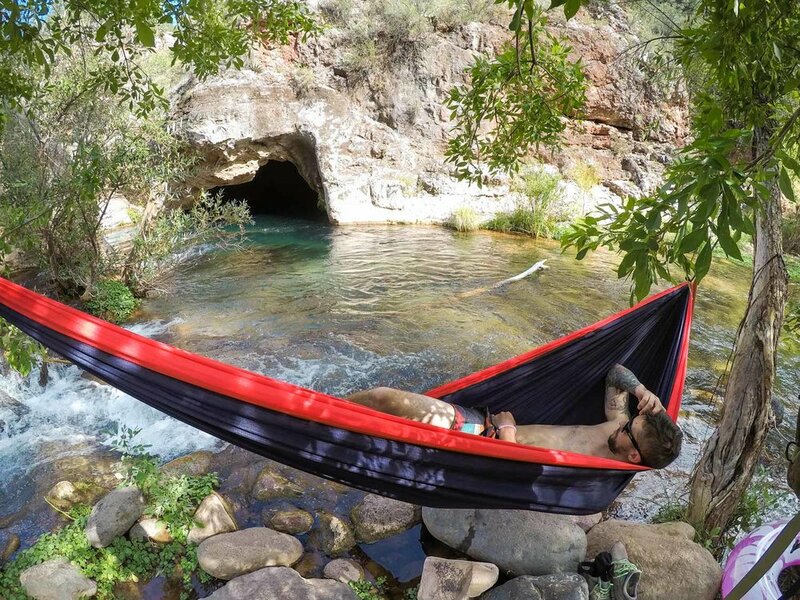 Fed by a natural spring, The Fossil Creek Wilderness Area is an oasis destination attracting hikers, sunbathers, cliff-jumpers, and swimmers to its crystal clear water. 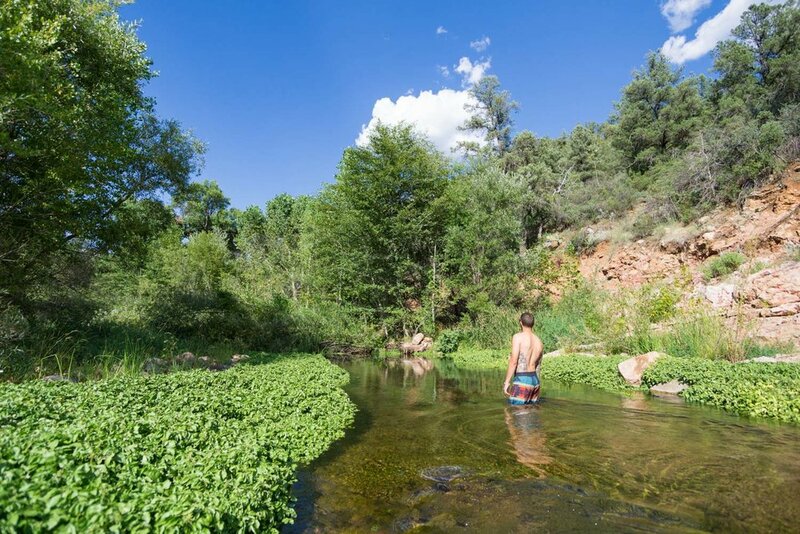 The 8 mile Fossil Springs Trail might seem like a daunting trek just to get to the water, but you'll find that putting in a little extra work can be worth escaping some of the crowds of the western trail heads. This spot has become so popular that they recently implemented a parking permit system that requires visitors to reserve online in advance, limiting the number of visitors each day. 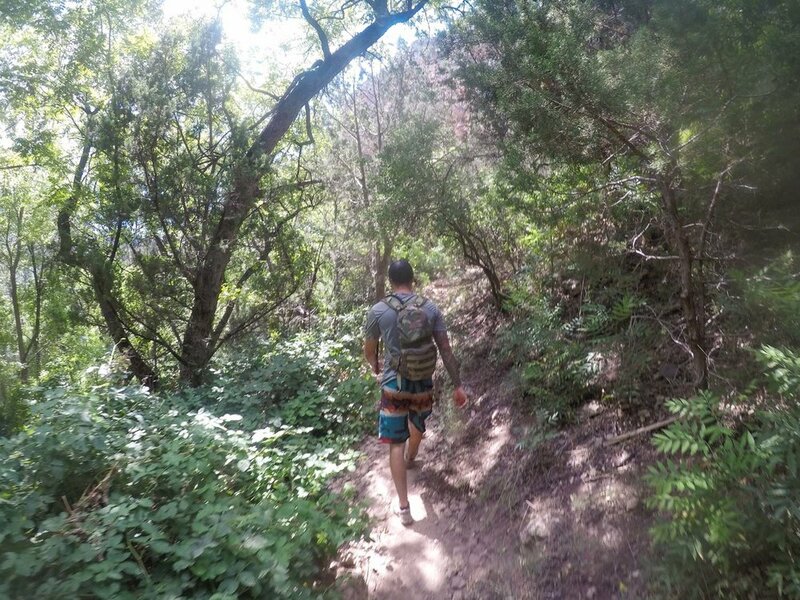 This specific trip report is about the 8-mile trail (Fossil Springs Trail) to the old dam, aka the Toilet Bowl, and is not as popular as the shorter hike from the Waterfall Trailhead. From April 1st to October 1st, you'll need to reserve an online permit to hike this trail. You can start reserving permits starting a month before your planned hike, so if you wanted to hike May 20th, you’ll want to get permits on April 1st. Permit information and reservations are available here on Recreation.gov. Be sure you double check which parking lot you are signing up to get a permit for. Don't forget to print it out and bring it with you! The drive to the trailhead is about 2.5 hours from Phoenix, AZ, and the entrance gate sits after the turn off in Strawberry, AZ. You'll need to show your permit at the gate to continue to the dirt lot, and this gate closes at 4PM with a one way spike barrier for those exiting after 4PM. Since we were coming from Phoenix, we didn't arrive at the parking lot until noon, but there were still only about 6 cars parked in the lot. The trail starts heading down the side of the canyon with views of the desert valley. We passed at least 5 signs in the beginning of the hike warning of the heat and the difficulty of the hike. Lots of people must underestimate how strenuousness the 8 mile hike, the heat of the sun on the exposed trail, and the amount of water they need. It really is straight downhill the entire time until you reach the bottom of the canyon. We started to hear the sound of rushing water and soon got to the falls! The creek was calm enough to cross upstream of the falls to the other side and check out the toilet bowl. The water seemed to be rushing quite strongly, and just looking down into the toilet bowl made me nervous - I can't imagine anyone jumping into that swirling water! There was a rope with a ladder that seemed to descend into the toilet bowl. The 70 degree water felt so nice after a dusty hot descent into the canyon, and the water was so clear! 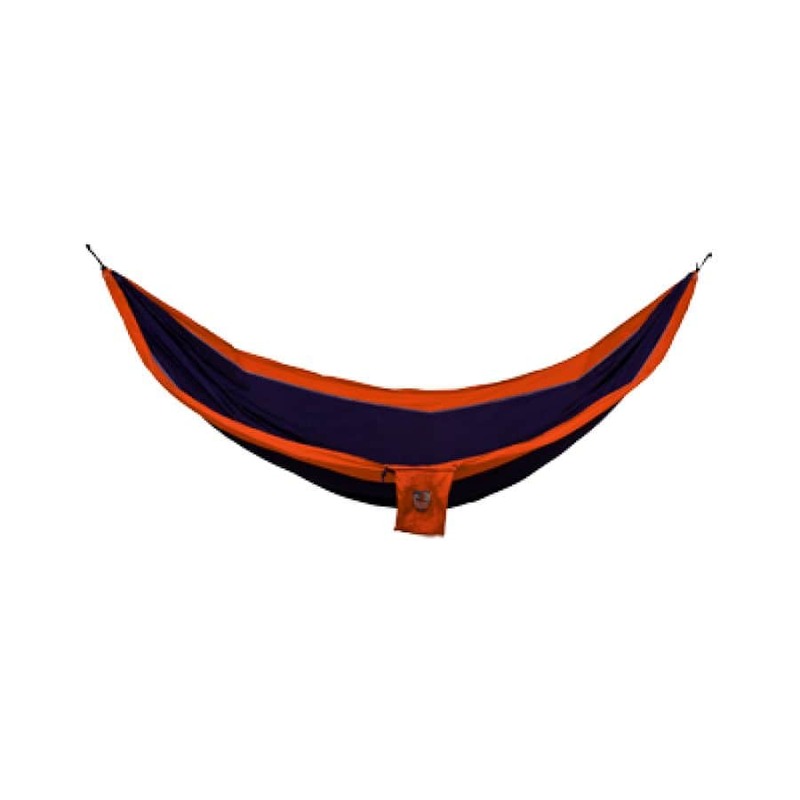 We headed downstream where the water settled down a bit, set up the hammock in some trees by the river, blew up the floaties, and jumped in. We were amazed by how many fish there were in the shallows as well as the moving creek. They didn't seem to be scared of us at all, and even seemed a little curious. My favorite part about this whole trip was this incredible cave grotto plenty large enough to explore. 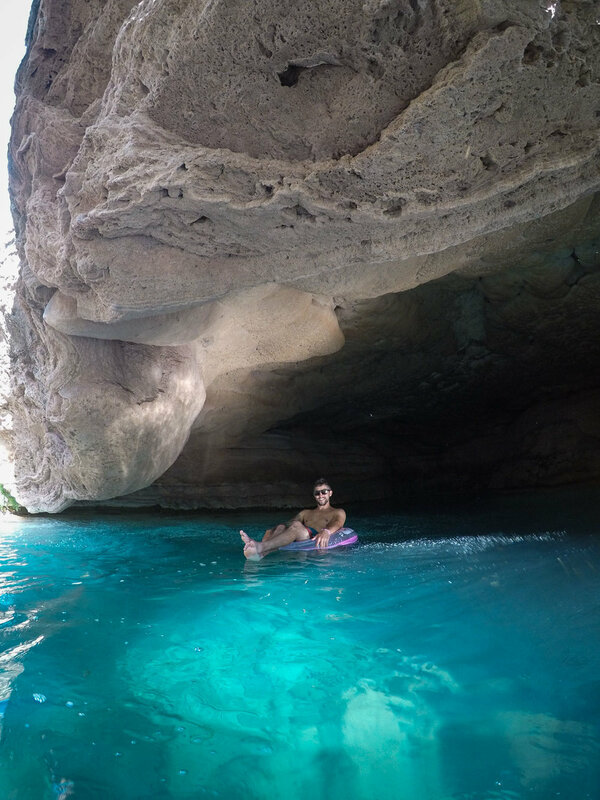 When the sun hit the water just right, the turquoise color really lit up the cave. I could have easily stayed here all day floating and exploring all the nooks and crannies of the unique rocks. Since we didn't get down to the water till about 2pm, we were really lucky to have the entire place to ourselves on a Friday afternoon. I can imagine it getting pretty crowded in the water on days where permits were completely booked. One of my favorite shots from this trip.. spot the fish hanging out below? After having lunch and taking a short nap in the hammock, we decided it was time to head back up. Since the return trip would be all uphill, we gave ourselves a little extra time to gain back the 1,500 ft of elevation we descended. We were thankful to be hiking close to sunset on the climb up - it would be pretty tough if it were the hottest time of the day! I can see why Fossil Creek Wilderness is such a popular hot spot, it really feels like an oasis in the desert.